There are a lot of stories in this story. There’s a story about being a choreographer — how to become one, and what it’s like to be one. Taylor Mitchell is unusually eloquent in his movement vocabulary, and just as much so in sharing his always-carefully-constructed perspective. So when we heard that his first major professional dance work, Red Beans and Rice-ly Yours, was also going to be his most recent dance work, we thought it would be a good time to hear more about his journey. There’s another story in this story — about being a dance company. The Big Muddy Dance Company in St. Louis is performing Meet Me In … (on Friday, April 6 at 8pm and Saturday, April 7 at 2pm) at St. Louis’ Grandel Theatre. Meet Me In … is about Big Muddy’s hometown of St. Louis, about its roots and heritage and its great icons. It’s a program that will include work by Artistic Director Brian Enos, world-renowned choreographer Robyn Mineko Williams, company dancer Robert Poe, and Taylor Mitchell, which gets us back to that first story. Except there’s one more story here, about being a new choreographer and working for the first time with a dance company, which is what happened to Taylor when he first created Red Beans and Rice-ly Yours, for Chicago’s DanceWorks just a few years back. Johnny Nevin: You’re piece Red Beans and Rice-ly Yours, will be performed at The Big Muddy Dance Company’s Meet Me In … performances at St. Louis’ Grandel Theatre on April 6 and 7. Can you tell us a little about the work? Taylor Mitchell: Red Beans and Rice-ly Yours, was originally created with DanceWorks Chicago as a part of their 2014 DanceMoves Choreography Competition. It was inspired by the migration of New Orleans Jazz music brought to the streets of Chicago as a part of Louis Armstrong’s “Great Chicago Concert of 1956” album. I created it as a personal dedication to my first move to “the big city”. Over the past three seasons, Red Beans and Rice-ly Yours, has charmed audiences throughout the midwest and Germany with its soul and classic southern essence. Johnny: This is a work that you originally created for DanceWorks Chicago. What was it like for you, with your first major choreography commission, when you initially created the work? How much was the actual reality of creating a work for a professional Company different than what you had imagined? Taylor: I remember this commission being quite an intimidating challenge at this pivotal launching point of my choreographic career. Working with the exquisite dancers at DanceWorks Chicago forced me to further develop my process, which seemed to create endless possibilities — which at the time completely felt like a blessing and sometimes curse! Making the transition to creating professional work after choreographing in a college setting can feel like a major jump. I recall gaining a new sense of trust and communication with the dancers in this process, as I owe so much appreciation to DanceWorks Chicago for providing the steppingstone for myself in my development as an early career artist. To a dance creator, a piece of choreography can serve as a living journal of past reflection. Johnny: You’ve done a lot of work since then, so to return to Red Beans and Rice-ly Yours, in the context of working with a different company in a different city must have been the source of some surprising perspective changes. How did the work seem different to you as you worked with Big Muddy? Taylor: To a dance creator, a piece of choreography can serve as a living journal of past reflection. I have had lots of “creative mileage” since the development of Red Beans, but I can always go back to my mindset when I revisit a previous work. Luckily, since the piece was already finished, I was able to further develop a few sections and refine some of the movement vocabulary which showed me how much I’ve grown as a choreographer over the past years. The process with The Big Muddy was a true pleasure since they were open to the sense of play and joy that the piece demands. 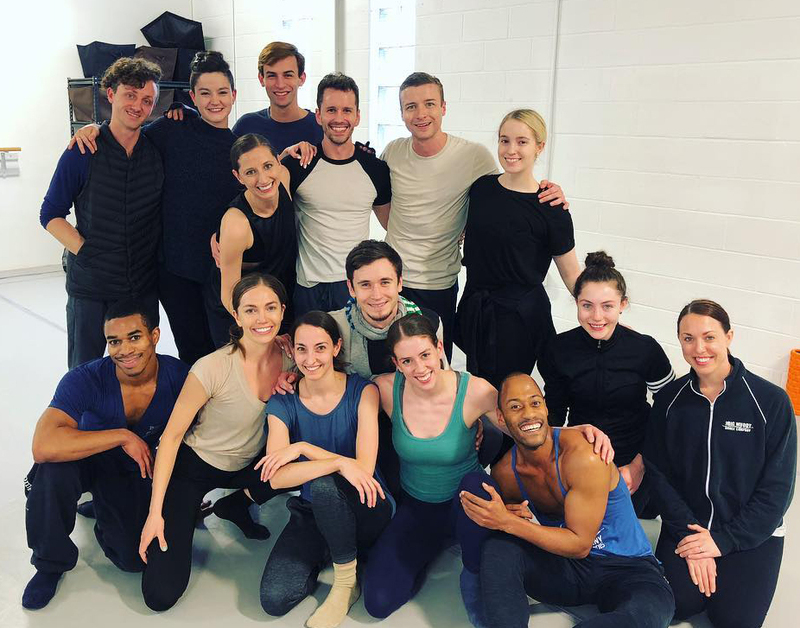 Originally set on a cast of six dancers, I was able to expand the work to a cast of eight performers, which I think will further complete its upbeat and lively score! Johnny: Many of us share roots in Thodos Dance Chicago — how much was working with old friends a part of the process, and what was it like discovering the other artists at Big Muddy and what they could bring to your vision? Taylor: Great that you ask! I was fortunate to cast CJ Burroughs and Thomas Jacobson from my past dancing, choreographing, and performing within the Thodos circle. I also was able to work with a former “UA Wildcat” Kelly Schneider. Reconnecting with these dancers from my past career was a special treat to this process. I was particularly pleased with the energy that The Big Muddy dancers brought to this work. They provided such a soulfully rich and mature approach — I’m quite pleased with the outcome! They were not afraid to chuckle and add their individual personalities — which is so key to the success of my choreography. [The Big Muddy dancers] provided such a soulfully rich and mature approach — I’m quite pleased with the outcome! They were not afraid to chuckle and add their individual personalities — which is so key to the success of my choreography. Johnny: You’ve always got a few more-than-intriguing projects cooking. What are you working on next? Taylor: This past winter/early spring I served as an Artist in Residence with Southeast Missouri State University and just completed a Residency with Keshet Dance and Center For The Arts (Albuquerque, NM) focused on my solo work as a performance artist. Currently, I am captivated by the powerful synergy that results from the fusion of clown technique and contemporary dance. I am working on the development of this work as a performance artist, choreographer, and currently in research to solidify my own specific technique. I am in negotiations for future endeavors, but must keep my mouth hushed for now. Stay tuned.. Instagram: mitchellmovement.